In 1915, researcher Edward Thorndike discovered the “Halo Effect,” a psychological phenomenon that causes positive bias. He found that if an evaluator believed that a person had one strong positive trait—like being intelligent—this bias would automatically lead the evaluator to believe that the person’s other qualities—like work ethic or helpfulness—were also positive. The Halo Effect applies to brands and companies as well. This explains why social media marketing works so well. If you have a reputation for producing high quality, helpful, and thought-provoking articles, your audience will be likely to believe you are excel at other things as well—like providing goods or services. Marketers who understand the Halo Effect can wield social media to extend their halo, shining the public’s light on their thought pieces and other positive brand builders. Before you post, understand your audience. Have a thorough understanding of why they spend time on their social networks, and what they are hoping to obtain. For example, the folks here at Hootsuite found that Google+ users want to learn about a specific topic, while Facebook users check in to connect with friends. Over at LinkedIn, according to Quicksprout, 60% of users are interested in learning about industry insights, while only 38% are interested in new products and services. The culture and audiences of the different social platforms should inform all of your content creation. But understanding who uses the different social networks is only the first step. In order to know what kind of content to produce and share, you need to develop a deep understanding of the ultimate end-user: your business’ client or consumer base. The only reliable way to understand your specific audiences is through research. You may not think it’s worth the effort, but the rewards are quite substantial. 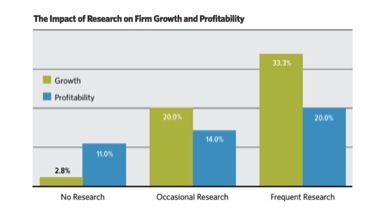 In fact, a recent study found that firms that conduct systematic research on their audience and competitors grow almost 12 times faster than, and are almost twice as profitable as firms that don’t conduct research. 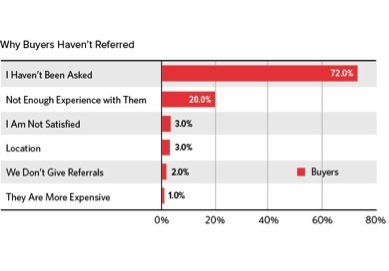 Through our research, we learned that the number one reason why buyers do not refer their service providers is simply because they have not been asked. Asking for help evokes a powerful human response—whether in person or on social media. In fact, according to social scientist Dan Zarrella, tweets with the words “please retweet” garnered 160% more retweets than average posts, with other variations of that request also performing remarkably well. Of course, you don’t want to overuse it, but simply asking your network to help you spread valuable content will yield powerful results. While each social network has its own nuances and best practices, there is one huge no-no that applies to all social media marketing. Here it is: Don’t sell. And if you’ve heard it before, it still bears repeating: Don’t sell. It can be tempting to use social media to sell your products or services. After all, you’ve got free access to a huge audience—what’s to lose? But just as people find door-to-door salesmen and phone solicitors annoying and intrusive, they also feel that way about salesy social media posts. Focus on sharing valuable, positive content that is relevant to your target audience, and watch your brand—and profits—grow.